For over forty years, from Symphony Hall to Singapore, the New Black Eagle Jazz Band has delighted audiences worldwide with its infectious, soulful and uplifting style of traditional New Orleans jazz. Paying homage to the greatest musicians of the early jazz era- Louis Armstrong, Jelly Roll Morton, Duke Ellington -the band has also developed its own eclectic sound, incorporating spirituals, 1920’s and 30’s popular music and even some songs recorded by Elvis and Bob Dylan! Widely-recognized as one of the premier traditional jazz bands in the world, the Black Eagles enjoy performing in a variety of settings, from intimate pubs to huge concert halls. 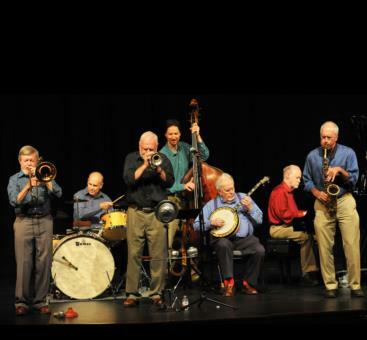 They have been featured in numerous prestigious jazz festivals, including the Newport, Kool, JVC, Tanglewood, Edinburgh, and New Orleans Jazz and Heritage festivals. The band has also appeared in concerts accompanied by symphony orchestras- the Scottish National Symphony, the Delaware Symphony, the Baltimore Symphony and the Boston Pops among many others. With a Grammy nomination to their credit, a vast repertoire, seven inspired musicians, and a highly entertaining stage manner, it’s no wonder that the New York Times has noted that the Black Eagles are "So far ahead of other traditional bands...there is scarcely any basis for comparison."